A perfect combination of urban art and daily wear chic. 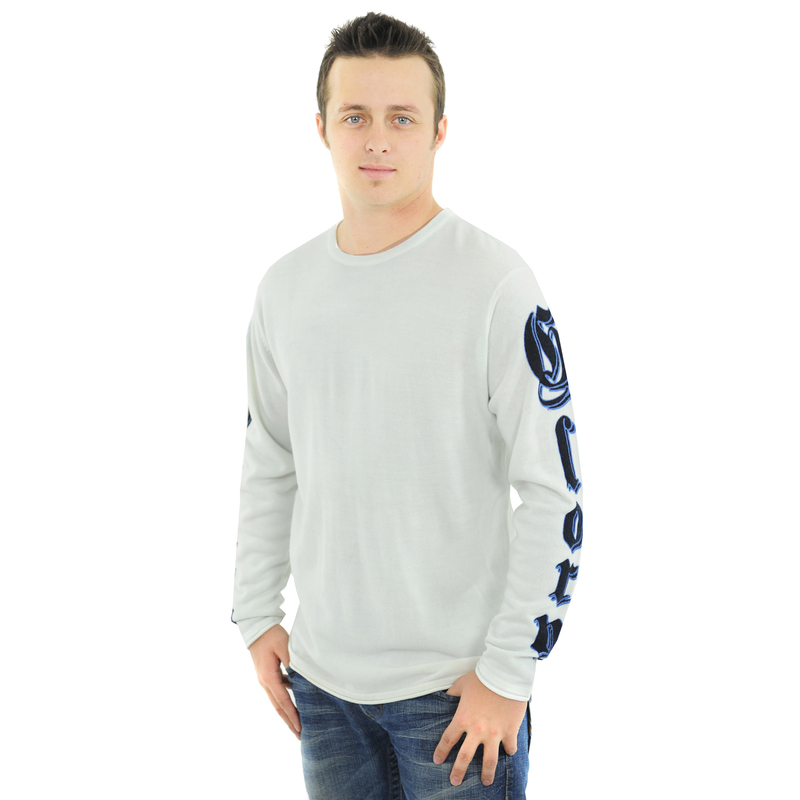 This green sweater has a clean front view and features a blue and black Panther on the back and "Death with Glory" in blue and black letting along the arms. Warm but thin and light enough for everyday use throughout the seasons! Cutting edge and bold, RAW 7's couture designs have revamped cashmere's image from traditional to avant-garde and street chic. Founded in 2003, RAW 7 was inspired by a love of urban art. The collection features vintage and pop art designs, rock icons and well known university emblems, all remixed and reinterpreted to reflect RAW 7's unique edginess. Made from the best quality cashmere, silks and imported leathers, the Los Angeles based luxury brand has become known for its rock and roll inspired tops for men and women that are not only comfortable but are wearable works of art. Each piece is first emblazoned with original artwork and then either hand adorned with beads and rhinestones or carefully hand detailed with retro embroidery. The initial collection of only six cashmere sweaters has quickly blossomed. RAW 7 has quickly become one of the hottest labels in Hollywood. Celebrities including Madonna, Ben Affleck, and Jennifer Garner, Usher, Paris Hilton, Lindsay Lohan, Cameron Diaz, Gwyneth Paltrow, Heidi Klum, Jessica Simpson, David and Victoria Beckham, Kate Hudson, Kate Moss, Oprah Winfrey, Uma Thurman and Claire Danes have all be seen wearing its clothing.